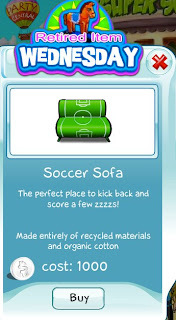 It's Retired Item Wednesday again and today we're retiring the Soccer Sofa. For all of you fans that eat, sleep and breath soccer, this is definitely for you. It would only be available till midnight Wednesday, and then would never be offered again!